Sam Williams III, our owner is an auto detailing expert in Montgomery, AL with more than 17 years of experience in the car industry. When he was selling cars, he always enjoyed cleaning them to make them shiny and appealing to potential buyers. In 2005, Sam started a mobile car wash company serving commercial clients and detailing cars for dealerships. He enjoyed an established client base and a solid reputation. Sam decided to expand with a physical location to provide high-quality vehicle detailing to all kinds of customers. 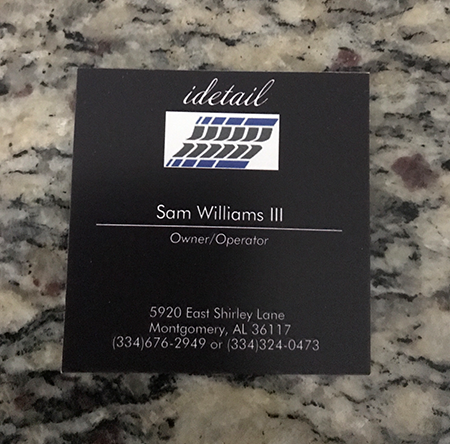 Sam established iDetail in Montgomery, AL, and offers a full range of exterior and interior car detailing and cleaning services for retail automotive. He enjoys the work and cares for your car like it's his own. Sam gets instant gratification in taking a vehicle that's nasty and dirty and transforming it into something beautiful. And he finds it rewarding to produce exceptional results that make you smile. As an ex-athlete, Sam likens the experience to sinking the big shot in a basketball game or scoring a winning touchdown. Let our auto detailing expert hit a home run cleaning your vehicle.